REMIX SERVICES, Killah Kuts, USA, Unknown Year... Bow Wow feat. Mike Jones - Fresh Azimiz (Clean Mix), Fresh Azimiz (Dirty Mix), Fresh Azimiz (Instrumental), Fresh Azimiz (Acappella), Jamesy P - Nookie (Radio Mix), Nookie (Jabb's More Fire Mix), Nookie (Trinidad Burning Mix). 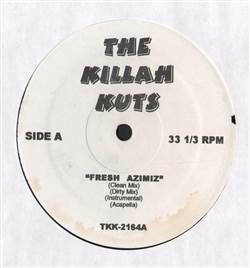 50 Cent / Juelz Santana / Omarion - The Killah Kuts 12" Various - Smooth Grooves 12" Allure / Assorted Phlavors / Babyface - Head Over Heels / Make Up Your Mind / Every Time I Close My Eyes 12" R. Kelly / Mariah Carey / Keyshia Cole / Jim Jones / Dipset / Faze - The Killah Kuts 12"
Jay-Z / Lil' Kim / Nas - Crib Underground 12" Various - Record Review 1 12" Freeway / Webbie - The Killah Kuts 12" Olivia / Tarralyn / Truth Hurts / Junior - Sounds Of R&B Vol. 7 12"